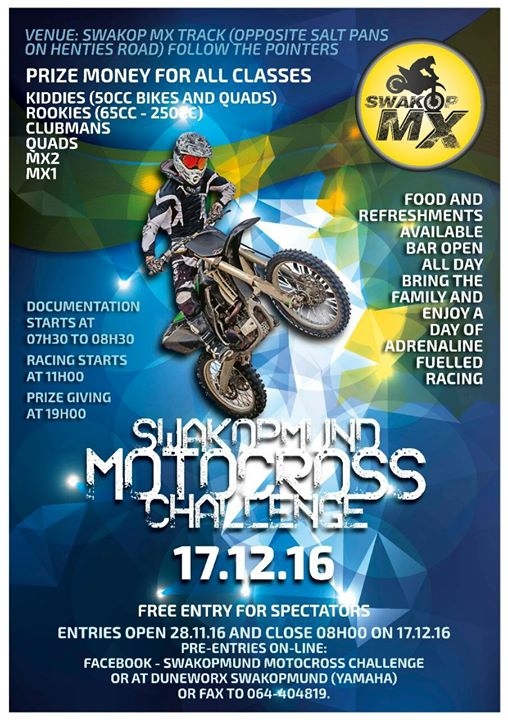 Swakopmund Motocross is proud to present a day full of racing fun! Oir main sponsor is J&P Hydraulics. This event will be updated as we progress to the big day. Entry fee will be 150 Namibian dollars. In the coming days we will upload banking details and entry forms. You will also be able to enter at Duneworx Yamaha as soon as the relevant documentation is available in this event. You must have a medical aid. We have a lot of cash prizes. We will also have random prizes e.g. tyres. There will be four heats around 10 minutes each and then a King of the Dirt. We are looking forward to welcome you in Swakopmund!